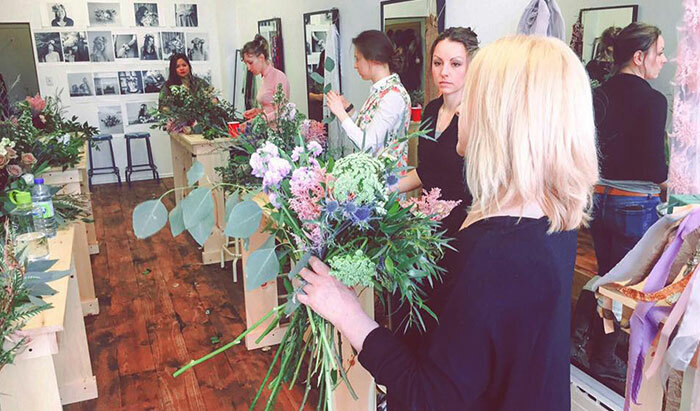 The start up program has been designed for beginners or those wanting to amp up and update their floristry skills. As well it is a perfect course for avid gardeners and flower lovers alike! You will learn your foundation skills and week by week move into more intense and intricate design work. Our goal is to teach you all the necessary current techniques while developing your skill and nurturing your own particular talents and aesthetic. Remember, ALL floral and hard goods will go home with you at the end of every class. As well as receiving your professional floristry kit, students will learn the most popular trends and flower and rose varieties. You will be presented with a power point sheet going over yearly availability of flowers as well as care and processing. 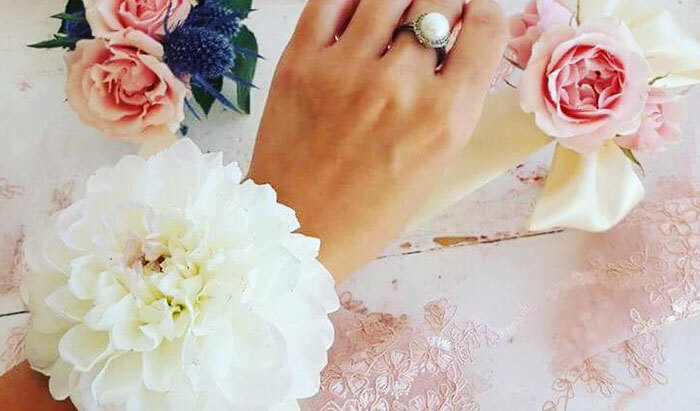 In class 1 we will cover the “need to follow” florists, trend makers and influencers on social media as well as TFS alumni who have ventured into self-employment. Students will be introduced to and familiarized with our preferred wholesalers with who you have immediate access with your tuition. You will learn wholesale pricing and bulk purchasing protocol. Project 1 will include a European hand tied bouquet focusing on muscle memory and technique. A vase arrangement will follow, learning proper tying and cutting techniques. In project 2 students will make a Grand European tied bouquet of beautiful seasonal blooms. No worry – no carnations or daisy’s here. Students will focus on spiraling techniques and proper flower placement. In project 3 students will design a large floral arrangement in foam. We will discuss foam types, the benefit of armatures, pin frogs and chicken wire. Proper foam cutting and saturating techniques. Students will learn proper flower placement and creative method design. Photographs will be taken to benefit your social media or websites. Project 4. Students will learn and create contemporary corsages and boutonnieres. Students will make 2 separate wrist corsages and 1 contemporary boutonniere focusing on simple and sturdy techniques. Techniques moving into the future of body florals. Our 2nd class is focused on wedding and events. We will discuss flower last ability, reviving hydrangeas and roses, delivery protocol and current wedding trends. In order to benefit your social media or websites time will be allotted for photography. You will make a romantic bridal bouquet full of delicate full blooms. 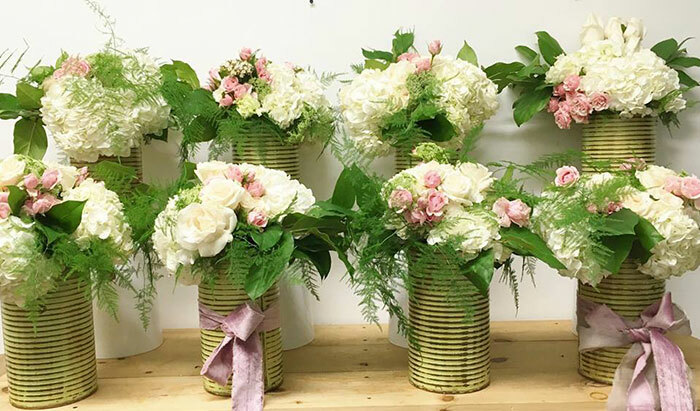 You will learn greenery usage, bouquet care, ribbon techniques, taping and tying and flower reflexing. You will make a Grand arrangement to sit high above a table. A centerpiece set for weddings or events. From the immediate techniques to final embellishment students will focus on creative placement as well as elements and texture. 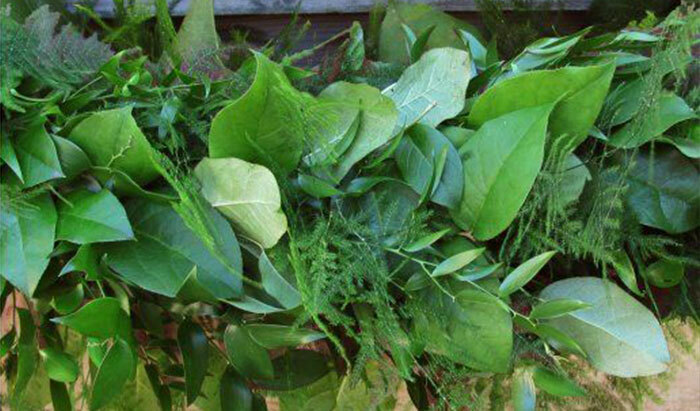 You will complete 2 floral table garlands each of different foliage and floral elements. A focus on wiring, calculating length, storage and technique will be discussed. 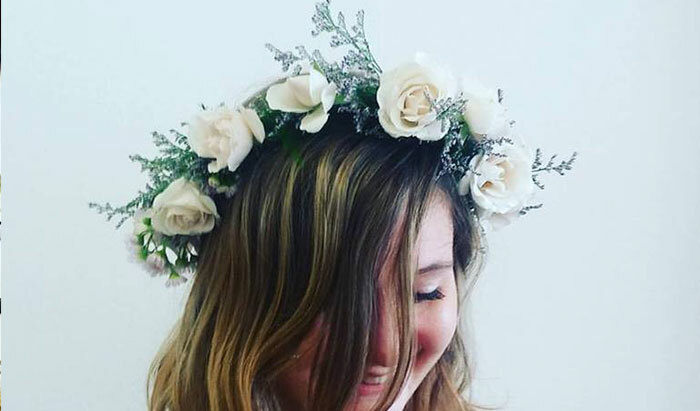 You will make a floral crown from contemporary florals and foliage. You will learn the most efficient techniques to enable you to make a beautifully contemporary crown in a reasonable time period. You will learn wiring, taping and flower placement while focusing on a contemporary design aesthetic. This class is focused on Garden Style design. The most current form of design in floristry today. Although often a struggle to learn at first, students soon grasp its beauty and seemingly carefree design esthetic. 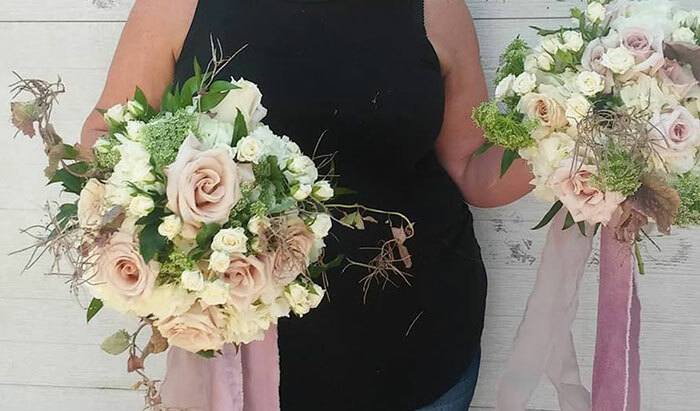 For project 1 you will make a garden style bridal bouquet. Attention to proper technique and colour connection will be taught as well as the foliages and florals essential for this style of design. Ribbon techniques, stem cuts and a firm effort to make your bouquet “look effortless” will be applied. You will learn the benefit of amateurs like the Holly Chapple Egg and chicken wire as opposed to free style design. You will make either a garden style arrangement in a pedestal vase or a Marie Antoinette arrangement, depending on the student’s preference. By now skill sets have begun to develop and these stunning and intricate designs of exquisite blooms will become exciting to design with. At this point students are confident and thrilled with their success. We will stage and photograph your bouquets and arrangements to compliment your social media pages and websites. Our graduating project will be a floral arbor. The focus will be the design and application of florals to the arbor. This essential need to know project will teach you the mechanics and proper techniques to make a stunning display. You will learn proper cost and delivery mark ups all the while creating a full sized, flower filled arch. 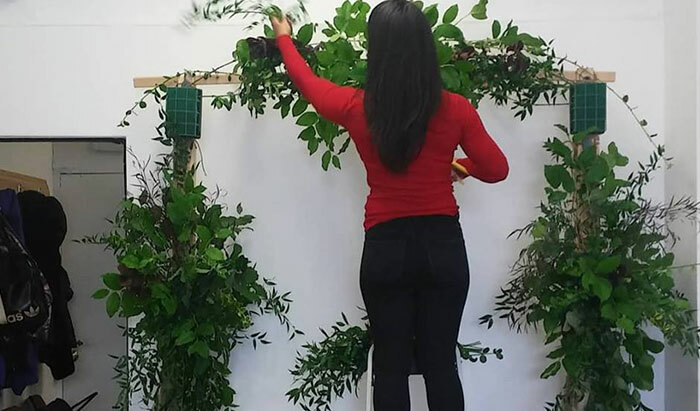 At class end the arbour will be disassembled and students have the option of taking the florals home with them. Time is allotted for photography and staging. 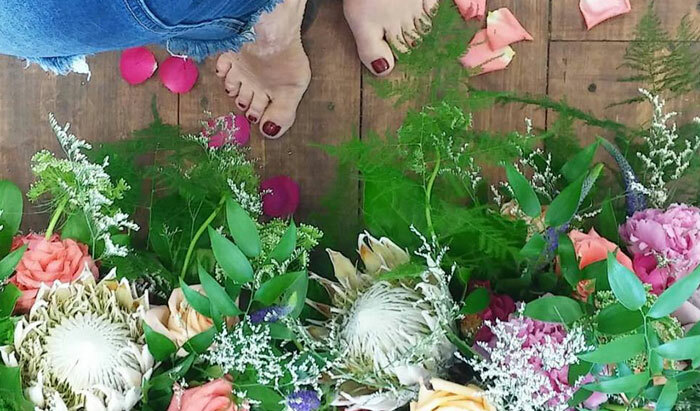 After completing your arbor and photography you will receive your official Toronto Flower School diploma. Your mentor-ship shall last as long as you require it. Students may call, email or come by with any floristry related concerns. From wedding quotes to flower recognition, lastability, seasonality or design help you are free and welcomed to access us. We have had success in finding Toronto Flower School students job placements in the industry. 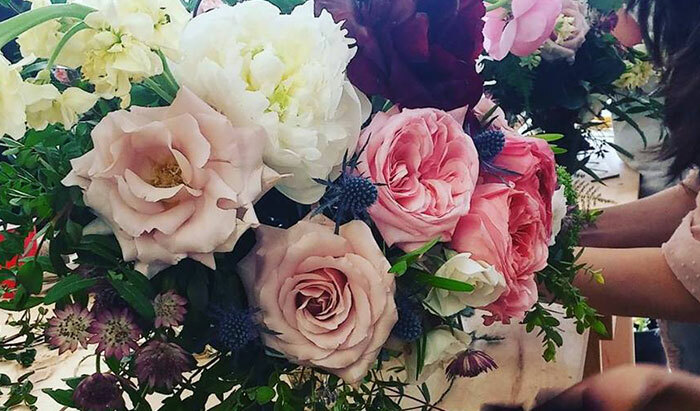 On your behalf Toronto Flower School will reach out to florists of your interest. With your mentor ship students will have access to 20 free hours at the florists studio for design work or consultations. The studio is not available Sundays and some Saturdays. Students receive a T.F.S discount on all upcoming events and seminars. For dates and availability click here or the pink button below. move on to self-employment or employment in the flower industry. 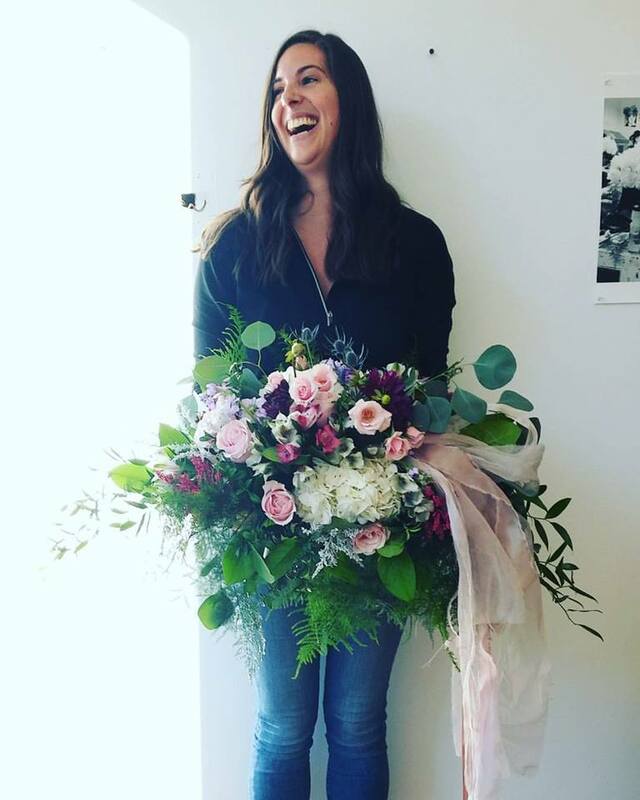 Our students success is proof that the TORONTO FLOWER SCHOOL is your only choice when it comes to contemporary high level floral design training. When do the next classes start? What days are the classes held? Great question! 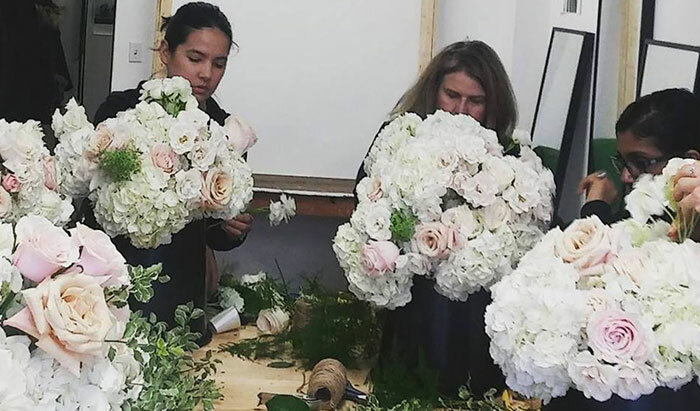 Unlike many other floral design programs that schedule training sessions on weekdays, the TFS Start-Up with Design Program happens on Sundays (time dependent on which Cycle you join). That means you can attend TFS without impacting your current job or schedule. However please note once the Sunday cycle reaches capacity (8 students), a special Saturday session will be added and you’ll be notified if your training is Saturday or Sunday. This way we assure class sizes remain small. Of course feel free to contact us at any time if you have questions. What happens when I sign up’? As soon as your payment has been processed (which can take up to 15 minutes) you’ll reserve your spot on the date selected. I haven't done a program like this before ... Is this still right for me? Absolutely! This program will provide a tremendous foundation of floral design skills. And secondly, you’re going to learn my personal secrets about turning your passion for flowers into a profitable business. Whether you’re a beginner or a seasoned pro, you’re in the right place. 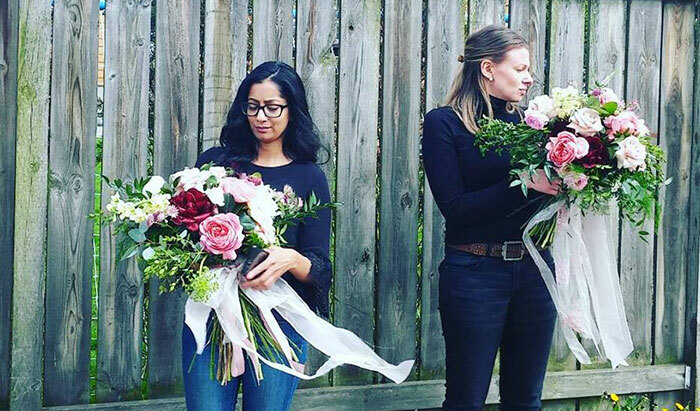 Why does Toronto Flower School offer less hours than more traditional schools? We have been asked that question many times and the answer is, simply, money! Other schools could never afford to offer the level of florals, hardware, kits and knowledge we put into a 3 week course over 2 or 3 months. We insist on the highest levels of product from start to finish..how else can you learn proper up to the minute designs and floristry knowledge? 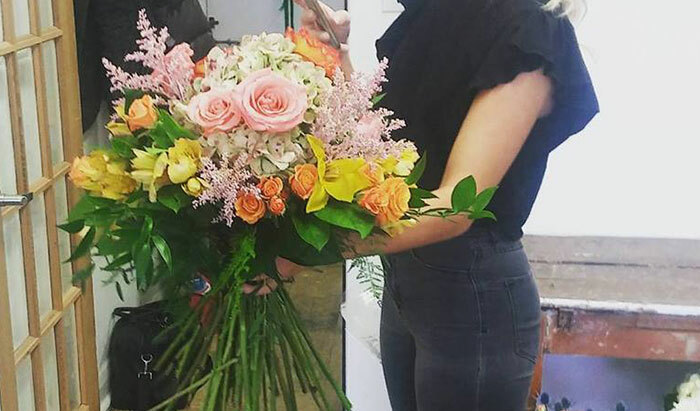 If Toronto Flower School were to offer you a course extending over months, one of 2 things would happen… the cost would not be affordable or the product and teaching would suffer. Our students are not interested in learning with dated florals and vessels and learning dated techniques. Careful planning and attention go into every course cycle and with your after course mentorship, your learning will last as long as you need it! How do I know if Start Up with Design is the right place to start? The Start Up with Design program is training that you will use for the rest of your career, referring back to it’s content over and over again. It provides valuable strategy in addition to critical hands-on training. Will I recieve a diploma when my course is done? Yes. we are proud to present our students with a Toronto Flower School diploma. Now more than ever the TFS diploma is giving our students the leading edge in securing a job or internship. 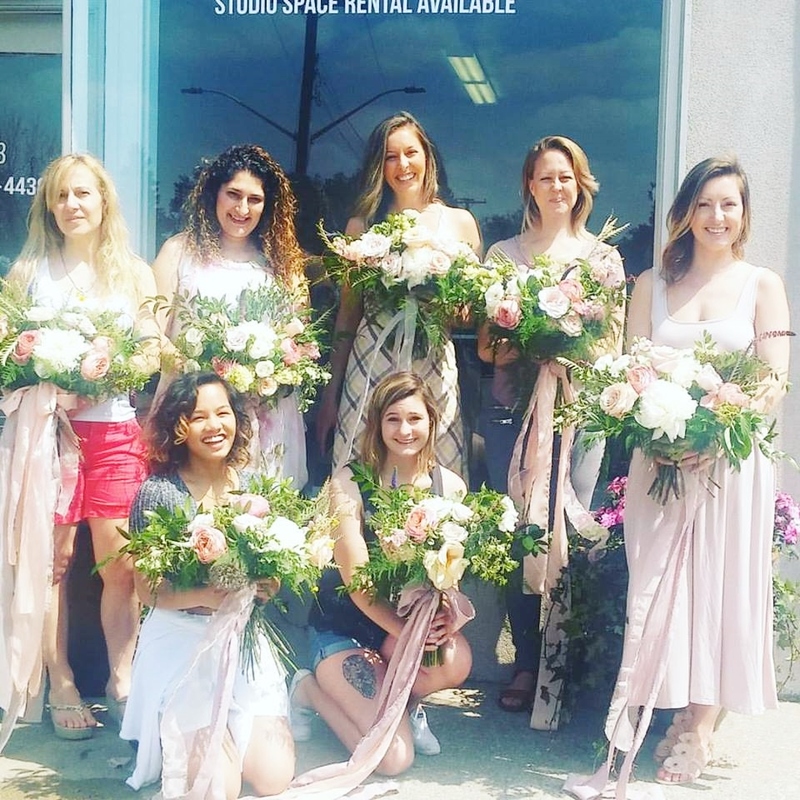 Many prosperous floral studios in Toronto are referring students to Toronto Flower School with a guaranteed internship or employment on course complement. Your results are entirely in your hands. If you don’t follow through then you won’t unlock you hidden potential. However, if you choose to TAKE ACTION on what you’ve learned, you’ll be blown away by what lays in front of you. I'm from out of town or would like Private Training, what should I do? Great question! You can visit the registration page or click here to request Private Training with Mary. This is ideal for people who live out of town or have a busy schedule that needs to be accommodated.